So writes Barbara Karnes, RN who noticed, after her experience at the bedside of hundreds of people before they died, that each death she witnessed was following an almost identical script. Each person was going through the same thing. And most families had the same questions. In our society death is practically viewed as optional and is definitely a conversation stopper. Most of us are woefully unprepared when a loved one dies. Consequently Barbara took it upon herself to provide instruction to families, friends, caregivers and professionals about the dynamics of dying beginning years to moments before the last breath. Just as there is a labor of birth, there is a labor of dying. 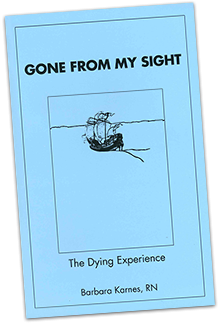 In 1986, Barbara published Gone From My Sight: The Dying Experience. This booklet has been so popular with the hospice movement that it is simply referred to as “The Blue Book.” It is a clear, practical, insightful and poignant description of the signs of approaching death. Her other booklets are The Eleventh Hour; A Caring Guideline for the Hours to Minutes Before Death, and My Friend, I Care: The Grief Experience. Her book, The Final Act Of Living: Reflections Of A Longtime Hospice Nurse, is a comprehensive end of life resource that offers knowledge to ease fear and misinformation about dying and death. Based on her experience caring for her dying parents, she wrote A Time To Live, a booklet focusing on palliative care and dedicated to her parents. They died within five months of each other from lung cancer. 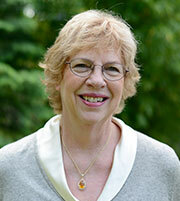 Barbara writes weekly blog articles on end of life issues. She answers questions and addresses comments submitted to her web site http://www.bkbooks.com. If you go to http://www.youtube.com/watch?v=PPx-qpos57g you can watch Barbara talk about her very astute and down to earth observations of people journeying toward their last breath. Knowing what to expect as a loved one is dying cannot ease the grief but it can allay the fears. Barbara Karnes is a remarkable resource.